High-rises crowd the Waikiki shoreline. IF ONE philosophically believes that out of adversity comes learning and growth, then the recent sight of raw sewage flowing down the Ala Wai Canal and the "No Swimming" signs on the beaches of Waikiki offer an opportunity for reflection. For years, members of the Waikiki Neighborhood Board have seen an endless parade of proposals for high-rise condominium development, time-share creation and hotel expansion. We have witnessed rampant development, motivated by short-term profits, at the expense of long-term sustainability. If Waikiki is the state's economic engine, and if we market the beauty of our islands to raise revenues to sustain the quality of life of our citizens, then are we not killing the goose that lays the golden eggs? In business terms, we need to think of our environment as our No. 1 capital asset. What responsible corporation would squander the asset that is its primary source of income? Environmentalists for years have been sounding warning alarms about inadequate protection of our resources and have always posed the seemingly unthinkable: "What if the environment deteriorated so badly that we ended up with "No Swimming" signs on the beaches of Waikiki? How would that be perceived on CNN around the country, and what would people think about taking that dream vacation to Hawaii?" Now, the unthinkable has finally come to pass. Repairing our infrastructure is obviously needed. Yet, while necessary, it is not sufficient. What is required is a shift in our collective thinking, so that we will take steps to protect our aina and actively ensure that we have sustainable vs. shortsighted growth. If this is a wake-up call, then what do we learn from it and what do we do about it? We can start by not remaining in denial about the significance and the fragility of our environment. Already some act as if we have successfully dodged a bullet. The feeling is that this was just a highly unusual, rare occurrence. Perhaps a hundred-year flood. Yet with record numbers of hurricanes and tornadoes and flooding around the country and the world, does anyone really feel confident that this was an event that will never be repeated in our lifetime? There was a rush to take down the "No Swimming" signs in Waikiki. People were assured that everything would dry up in the shining sun and all activity would resume in its normal course. The attitude seems to be that if we just repair the sewers, we can get back to business as usual. The important thing is to not think that we are solving the problem simply by fixing the sewers. It is not about just repairing the infrastructure. It is about putting less stress on the infrastructure. Next time, the event might not be a heavy rain or a sewer break. It is what we do or don't do every day that will determine our future. We see this attitude of denial everywhere. One of the ironies of the wondrous scenery of our islands is that it lulls us into complacency. It is so beautiful here that people simply assume it will always be like that. Without concerted effort, however, it will not. At the Waikiki Residents Association we have been calling for a carrying capacity study of Waikiki. How much more development can our infrastructure and our tiny strip of land bear? That question needs to be answered before we continue to approve development after development. A perfect example of this attitude of denial and complacency was the testimony of the Board of Water Supply before the City Council on a resolution for this study and its presentation to the Waikiki Neighborhood Board. When asked about the capacity of our water supply to sustain continued development, the BWS said in effect, "Don't worry. If you build it, we will water it." This attitude was demonstrated within the past few years when, for a short time, a legislative proposal was actually being considered that would have permitted a landfill to be placed over an aquifer in Central Oahu. What were they thinking? Maybe the next time, the headlines on the national news won't be "Don't go to Hawaii because you can't swim on the ocean." Maybe it will be "Don't go to Hawaii because you can't drink the water." This is a wake-up call because, in reality, environmental degradation goes on all around us every day. People now notice the Ala Wai Canal because it gave off a noxious odor and is in the news and on television. Yet the water is often brown and discolored and every time it rains, runoff from the mountains caused by day-to-day human activity contributes to this contamination. For years, paddlers in canoes developed rashes on their arms. We recoil in horror at news of the man who died from bacterial infections after he was briefly submerged in the murky waters of the Ala Wai Boat Harbor. Yet for years the harbor has been a virtual sewer, and the pleas of residents and boaters to clean it up have gone ignored. We continue to see examples of this attitude daily. Statewide, we saw it recently on Kauai, where an individual was fined $7 million because his private activity wreaked environmental havoc. Around our island, we are seeing it at Turtle Bay, where a development proposal based upon a 20-year-old plan would add huge stress to a fragile ecosystem. We see it in urban Honolulu, where cranes have now become the dominant theme of our cityscape. 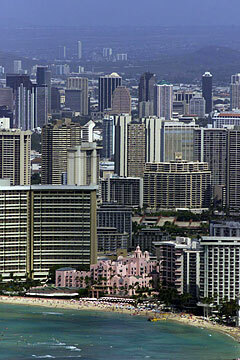 Even in Waikiki, where some think that every square inch of land has already been developed, we see ever-increasing commercial encroachment onto residential areas, as tight space and scarce resources drive commercial entities to expand into the little enclaves of solitude remaining for the area's residents. If this is to be a wake-up call, we need to understand that so long as decisions are made by individuals whose actions are motivated by short-term profits, we will not yield optimum environmental results. The private sector needs to realize that it is indeed killing the goose. Responsible and enlightened corporate citizens needs to recognize that their long-term economic interests dovetail with preserving our environment. It is nothing more than nurturing, rather than depleting, their prime asset. We also need a greater sense of public "ownership" of our environment. We need better land-use planning and tighter environmental controls from the government. We need each individual to take it upon themselves to become a steward of the environment. It is an effort that takes all of us. Yet it is well worth it. Not only will this provide a better quality of life for our residents. It will also promote the long-term economic well-being of our state. Louis Erteschik is the vice chairman of the Waikiki Neighborhood Board and a former hearing officer for the Department of Health, Environmental Health Administration. He is also the vice president of the Waikiki Residents Association and a member of the board of directors of Hawaii's Thousand Friends.